You can customize what your customers hear when placed on hold. Record your latest sales promotion or business hours. Or, upload your company’s jingle. The following topics will help you with common Music on Hold related questions. How do I configure Music on Hold? A. How do I configure Music on Hold? Go to the Site Services tab. Select System to play the default system hold music when callers are placed on hold. 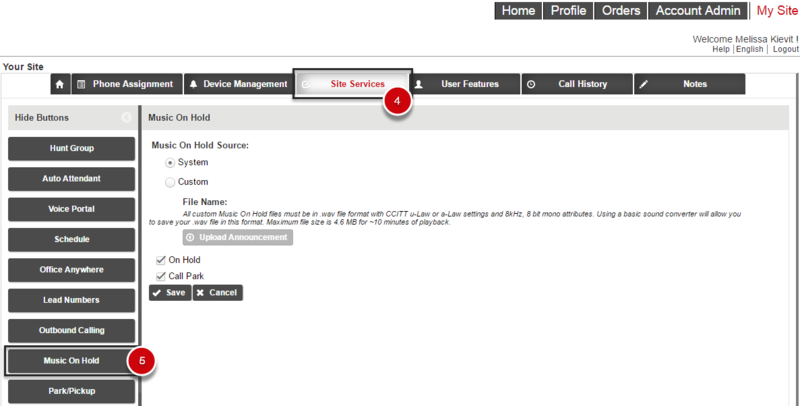 Select Custom to upload your own music file to play to callers when they are placed on hold. Click Upload Announcement to upload your file. Note: You can record your own announcements to play on hold with the Broadsoft Recorder app. Available in Google play and iPhone app store. Check On Hold to enable Music On Hold. Select Call Park. When selected, users will hear music or announcements when call is parked.